Next week, China's National Centre for the Performing Arts will host its third annual World Theatre Forum in Beijing, featuring several days of guest speakers from opera companies all over the world. Among those speakers will be three of Seattle Opera's own, invited by NCPA President Chen Ping to represent the United States. China's distinctive National Centre for the Performing Arts, located in Beijing, where the World Theatre Forum will take place. This year's Forum, held from June 20-23, will focus on the cultivation and development of young artists, the creative commissioning process, the survival and development of opera following the economic downturn, and the use of new technology in opera production. Representatives from Seattle Opera include Executive Director Kelly Tweeddale, Technical Director Robert Schaub, and Artistic Administrator and Director of the Young Artists Program Aren Der Hacopian. Tweeddale will present at the Forum on the impact of the physical performing space on the business of opera; Schaub will speak on honoring the art of opera through efficiencies and innovation on the stage; and Der Hacopian will speak about the dual role of the Young Artists Program in identifying and cultivating new talent and also developing new audiences for the company. In addition to the official program of the Forum, the Seattle Opera contingent will also meet with NCPA leaders to discuss possible collaborations in the field of opera. Attendees at the NCPA Forum include representatives from Staatsoper Unter den Linden, Oper Köln, and Bayerische Staatsoper (Germany); Teatro Comunale di Bologna and Auditorium Parco della Musica (Italy); Teatro Real de Madrid (Spain); Grand Théâtre de Genève (Switzerland); Canadian Opera Company (Toronto); National Opera of Korea and Seoul Arts Center; and the Stanislavsky and Nemirovich-Danchenko Moscow Academic Music Theatre (Russia), in addition to representatives from 15 Chinese opera houses. Representatives from all these theaters will converge upon by Beijing’s National Centre for the Performing Arts, well known around the world because of its iconic oval shape. Designed by French architect Paul Andreu, the NCPA opened adjacent to Tian’anmen Square and the Great Hall of the People in 2007. It houses three performance venues and has received praise for its stunning design, particularly beautiful at sunset, and superb acoustics. 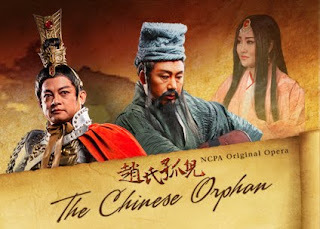 Attendees at the Forum will have the opportunity to hear the new production of The Chinese Orphan, by prominent Chinese composer Lei Lei, based on the well-known story.